This page contains links to web sites with information about our local schools systems which, in Florida, are organized by county rather than city. You’ll also find links to private schools and colleges and universities in the area. 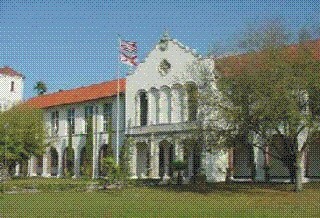 At left is a photo of St. Petersburg Senior High School, built in 1926 and featured on the National Register of Historic Places. St. Petersburg, Clearwater, Largo, Seminole, Tierra Verde, Madeira Beach, Treasure Island, Safety Harbor, Tarpon Springs, etc. New Port Richey, , Oldsmar, Port Richey, Land O'Lakes, Wesley Chapel, River Ridge, Holiday, etc. Tampa, Riverview, New Tampa, Apollo Beach, Lithia, Temple Terrace, Carrollwood, Town & Country, Brandon, Lutz, etc. Here are direct links to some of the more frequently requested private schools. For a complete list of private school in Pinellas County, click here. For Hillsborough County private schools, click here. St. Petersburg College - Formerly St. Pete Junior College, now offering 4-year degrees. Stetson University College of Law - First in the nation in trial advocacy training.